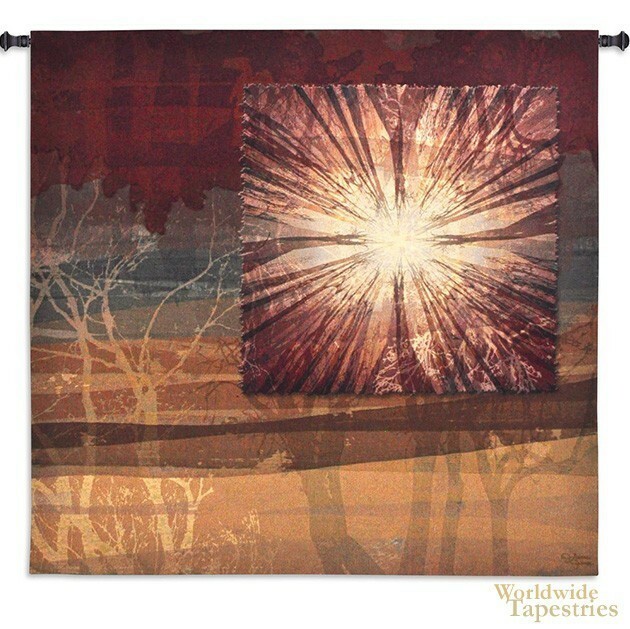 Audition tapestry shows a modern work of sun and trees in an abstract scene. Here we see the sun rays bursting through floral motifs in reds, in front of a background created by the superimposition of trees and landscape brush strokes. The color palette in this work is beautiful with earth reds, earth browns, and gray blues. This modern work is a celebration of the seasons and of nature and brings nature indoors in a modern way. Audition tapestry is backed with lining and tunnel for easy hanging. Note: tapestry rod and tassels, where pictured, are not included in the price.